There are not many companies that still provide this level of service anymore, and I appreciate it. I just installed new Galfer wave rotors on my 2001 ZRX 1200 Kawasaki, the installation was easy and took about an hour. So far I have been pleased with the stopping power and over all performance. The sales team was thorough and complete with all my questions and were very helpful in my decision making process, with out your team this purchase would have never happened and I would have gone with a cheaper and more inferior rotor. Thank you for making this transaction extremely pleasant. I received my lines on Tuesday and couldn't be happier! I have been singing your praises to anyone that will listen. As soon as I can afford it, I will be ordering the clutch and rear brake lines. I'm going to go onto the FZ750 site I belong to and ask one of my "brothers" if they have a set of stock lines you guys could use as a pattern. Have also informed the members of www.katanaplanet.com and www.sport-touring.net about your fine product. Amy Holland is publisher and editor for Friction Zone Magazine - Your Motorcycle Lifestyle Magazine. 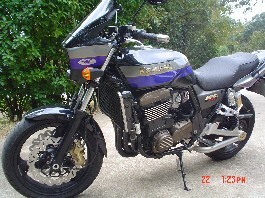 She purchased Galfer Stainless-Steel Lines for her 1989 Yamaha FJ1200. "Dear Cycle Brakes; Thank you very much for correcting the problem with the front brake line for my 1993 BMW R100GSPD. "I finally got around to installing the rotors and they worked out great. Thanks for your prompt, friendly service. Doug"
I wanted shorter SS brake lines for my 2" lowered forks and she helped me tremendously with e-mails and phone calls to "get it right"
I just wanted to drop a quick note that Jackie and Melissa made purchasing from you guys a breeze. I received a message about an issue with my order from Melissa. She picked up the phone before business hours and followed up in a timely fashion and had already corrected the issue. I know it sounds pretty mundane but after leaving a message on one of the numbers, she called the second to make sure that I would get the information. That extra couple minutes of effort makes all the difference as it is rarely done today.